But he wasn’t making up stories. I laughed when I found myself in that exact situation after leaving his shop—fumbling with a map and idling on green while patient drivers showed me mercy. It’s the kind of courtesy you might expect in a tiny, sleepy town. Waynesville is small by most standards, but it isn’t sleepy. Morganton and Lenoir have it beat by almost twice as many residents—even diminutive Black Mountain nips at Waynesville’s heels when it comes to population. But the sophistication of its offerings, whether on Main Street or the area of town dubbed Frog Level, will have you thinking you’re in the big time. The neighborly ways carry over to shopping here. There wasn’t one spot I visited where the owner or an employee didn’t greet me, and none minded striking up a conversation about more than just their wares. Home Tech [5 N. Main St. (828) 452-7672] is where all the big names in the culinary world hang out: Le Creuset, Fire King, Cuisinart, and Kuhn Rikon, to name a few. This is a cook’s toy store, where you can pick up a box of Maggie & Mary’s chicken-and-dumplings soup mix, the pot to cook it in, a ladle to serve it, and a cookbook in case you want to try it from scratch the next time. Or perhaps you’ll take home margarita mix and a blender. As a girl who doesn’t cook often, I fell for an item that could pass for an accessory—a supple, brown suede grilling glove by Outset for $20. It came up to my elbow and made just the right cookout fashion statement: I take my barbecue seriously. Alas, it seemed like overkill to buy it for the rare occasions I warm up a piece of chicken in the oven, but it will make a great gift for some lucky grill master. The magic of a great local bookstore is finding titles that the big booksellers might not find room for on their shelves, edged out by the latest John Grisham or Patricia Cornwell novel. At Osondu Booksellers [184 N. Main St., (828) 456-8062], I found more than one lesser-known title that intrigued me in the plentiful regional nonfiction section, including Meigs Line & the Cherokee Nation by Dwight McCarter and Joe Kelley. Reading about how two men retraced the boundary between the United States and the Cherokee Nation using clues from a journal, while I enjoy a pot of plum berry tea in the café, sounds like an ideal way to spend an afternoon. If Earthworks Gallery [21 N. Main St., (828) 452-9500] were a traditional exhibit space, the permanent show would be titled “Variety.” This gallery and frame shop has been in business for 17 years, likely due to its eclectic collection. There are colorful Zapotec woven rugs from Oaxaca, Mexico, woodwork, jewelry, paintings, and photography. If you have a serious soft spot for pottery, visit Blue Owl Gallery [11. N. Main St., (828) 456-9596], where the pieces are grouped by creators and colors, including the brilliant red vases and vessels by Ram Pottery. Stop in Textures [142 N. Main St., (828) 452-0058] to peruse a harmonious selection of furniture, paintings, and woven pieces by Gernandt’s wife, Suzanne. “Most of my work is functional, but her work is art,” says John, who crafts furniture. If you want to smell the beans roasting, while you sip coffee and laze on a burnt orange sectional big enough to seat 10 caffeine-craving buddies, head to Panacea Coffeehouse, Cafe, & Roastery [66 Commerce St., (828) 452-6200] in Frog Level. Housed in a long-ago grocery warehouse, this spot would suit any hipster, but the afternoon crowd is more likely to consist of 50-something women catching up and students, perhaps from Haywood Community College or nearby WCU, cramming for an exam. A late lunch of almond-grape chicken salad, with pretzels, fresh fruit dusted with powdered sugar, and blackberry lemonade only set me back $10.50 (cash or local checks only, please). For more privacy, grab one of a handful of seats on the shaded back porch overlooking Richland Creek. Pop over to the adjoining Leapin’ Frog Gallery [(828) 456-8441] to get an antique fix—china, paintings, furniture, and more. I bought a pottery vase and vintage French hair comb for $12 each. By late afternoon you may find it’s time for a glass of pinot grigio or a rich merlot at cozy cubby Vin Wine & Tapas Bar [20 Church St. (828) 452-6000]. Moms in need of an hour’s peace among grown-ups, second-home owners looking to make friends in town, and straight-up oenophiles come to this quiet spot. Owner Terry Thompson is happy to make a wine recommendation, whether you’re seeking a riesling or one of the reds (she likes Bogle’s Phantom). By-the-glass options rotate thanks to a collaborative relationship with The Classic Wineseller upstairs. Cheese boards, crackers, humus, tapenades, and beers are also on the menu. “Some people come for dinner because it’s like going to a little party,” says Thompson. AtThe Sweet Onion [39 Miller St., (828) 456-5559] you’ll find the Southern comfort food you’d expect if a trained chef got a hold of your grandma’s recipes, think bacon-wrapped meatloaf, cornmeal-dusted catfish, chicken pot pie, and smoked gouda scallop potatoes. There are also Asian-inspired dishes like peanut pad Thai. The lemongrass vinaigrette served on the house salad, which also features dried cranberries and candied pecans, is has a loyal following. 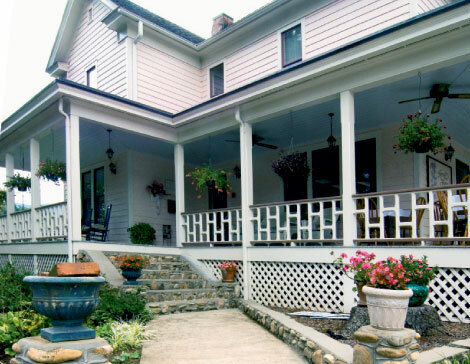 This time of year, the rooms at The Yellow House Bed & Breakfast [89 Oakview Dr., (828) 452-0991] come with a private fall color display on the five acres that surround the 1885 Neoclassical-style inn. The staff will set you up with a quilt and a packed lunch, so you can picnic next to one of two ponds or the waterfall. The charming Estaing Suite, named after a village in France, would be my pick. With a comfy four-poster bed, sitting room, wet bar, and two balconies overlooking the garden, I wouldn’t want to leave the room. Herren House [94 East St., (828) 452-7837] opened as a boarding house in 1897, and the hospitality tradition has carried on through several owners. Today, the house bears the surname of the second proprietor, Molly Herren. Location is one of the bed-and-breakfast’s many attractive features, since downtown is just a few steps from the front porch. The inn serves dinner from 5 to 8:30 p.m. Fridays and Saturdays. On a recent evening, entrée specials included prime rib with a horseradish cream sauce, chicken breast piccata over penne pasta, and Sunburst trout sautéed with white wine, almonds, and lemon. Look carefully or you might mistake the Haywood Arts Regional Theater [250 Pigeon St., (828) 456-6322] for an expansive, well-weathered barn. Constructed in the architectural tradition of the Summer Stock venues of the 1920s, the theater is a top-notch performance space and home to the Rodwell Gallery. Upcoming main stage events include Jane Eyre: The Musical in October, followed by Hamlet in November. Performances run year-round whether they take place in the James Auditorium or the smaller Feichter Studio. To bask in the fall foliage, you can make a quick outdoor getaway to nearby Pisgah National Forest, Great Smoky Mountains National Park, or the Blue Ridge Parkway. But in town, take advantage of the Waynesville Greenway, a five-mile trail that welcomes hikers and cyclists. Start your trek at the Waynesville Recreation Center [550 Vance St., (828) 456-2030] and follow the path around Lake Junaluska to see the golds and reds of autumn reflected on the water. It’s a gorgeous spot to reflect an itinerary for your next visit.